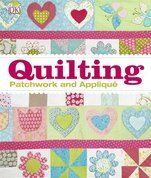 ​The Quilting Book has now been published by Dorling Kindersley. Seven of my quilts and a textile bowl are featured, together with the instructions for making them. This is an inspirational book for anyone wanting to learn quilting skills and a good reference source of patchwork, quilting and applique techniques. My Blog entry shows﻿﻿ how I became involved in this project.